For novice bakers, making a pie from scratch may be one of the most challenging feats. If you've never done it before, chances are, you don't have a pie pan just lying around. Luckily, you can use a cake pan in a pinch. For the best results, choose a recipe that makes a thick, juicy filling, like deep-dish apple or peach pies. A pie pan is usually round with sloped sides and is relatively shallow compared to a cake pan; it often has a fluted rim to accommodate the crust. Pyrex glass pans are considered the best because they heat evenly, but pans are also made of fired clay, tin, black steel and disposable aluminum. Standard pie-pan size is 9 inches in diameter and 1 1/4 inch deep, but it varies. Deep-dish pie pans can be as deep as 1 1/2 to 2 inches. Cake pans are typically made of aluminum, not glass. They usually measure 8 to 9 inches in diameter as well. 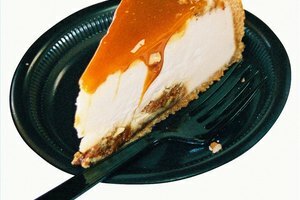 Cake pans are noticeably deeper than traditional pie pans, ranging from 1 1/2 to 3 inches deep. Round 8-inch cake pans work best for baking pies because they can accommodate the volume of most pie recipes. An 8-inch springform pan also works. Choose an appropriate recipe for your cake-pan pie; a deep-dish recipe is your best bet. A rolled, flaky pie crust or a graham-cracker or cookie-crumb crust can all be baked in a cake pan. For pie-crust dough, roll the dough out to about 12 to 13 inches in diameter. Place it in the 8-inch cake pan and press into the seams. Crimp the edges decoratively. For a cookie-crumb crust, press it onto the bottom and up the sides of the cake pan. Make the pie filling and place it in the pre-baked pie crust, then bake for the amount of time specified in the recipe. 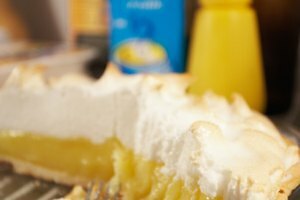 Check the pie; if the custard filling isn't quite set, or the fruit filling isn't bubbling hot, bake for 5 to 10 minutes longer. If the edges of the crust are browning too quickly, crimp foil around them to prevent burning. Add a top crust to a deep-dish pie. Cut slashes on the top to let steam escape during baking. 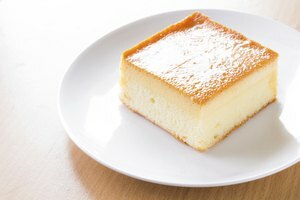 Experiment with a novelty hybrid dessert is called a pake—soft, spongy cake surrounding a crusted fruit filling.